Amazing vegan food at Afro deli on the West Bank! Do you live on or near the campus of the University of Minnesota, Twin Cites? Are you wondering where you can find vegan food in the area that tastes good and won’t break the bank? Whether you’re looking for full meals or quick snacks, look no further! This list was compiled by some of our very own student volunteers who live on or near campus. Their recommendations come from their firsthand experience dining at these vegan-friendly spots. When your hunger kicks in, give one of these places a whirl, and be sure to thank the restaurant managers for having awesome vegan options! Delicious pizza! You can get a personal pizza for only eight dollars with all the toppings you want, and they have Daiya nondairy cheese. The pizza cooks super fast—delivering instant gratification! There are many vegan bagels here, such as the olive oil rosemary, which is delicious. They have hummus as a topping and also sell it in tubs—perfect if you’re getting a dozen bagels to go. They also sometimes have a vegan soup option. Great cheap burritos! The Sofritas option is spicy tofu filling, but the guacamole does not come free, unlike the regular veggie bean burrito. You can also add roasted veggies. There are a few vegan options, including some baked goods. Try the Vegetarian Unwich without cheese and mayo. The avocado spread is great. Vegan waffles. Need we say more? They have a veggie pizza you can get without cheese. They have by-the-slice pizza prepared. Sometimes they don’t have the cheeseless veggie pizza as one of those options, but you could always ask. A few of their vegan menu items include the Indonesian Peanut Saute, the Japanese Pan Noodles, and the Pasta Fresca without cheese. There’s lots to choose from here! There are some dairy-free sorbets with many vegan toppings available. Delicious vegan baked goods and good coffee with nondairy milk! Most options are available in the morning before the usual coffee rush that happens before and between classes. In other words, get there early if you want the most selection! They have a bunch of vegan options, excellent salsas, and their beans aren’t made with lard, as they are in many other local Mexican restaurants. Check out the vegetarian menu and make sure to ask if there is fish sauce in what you order. They offer amazing veggie dishes over rice or in wraps, and the sauces are divine. You can also choose to add fresh uncooked veggies, and they also offer salads like their pickle salad and tabouli. Favorites includes chana masala, falafel sandwiches, and pyazi, which are veggies fried in dough. There is a vegan chocolate chip cookie option. Be sure to specify that you want the vegan one! Try the Vegetarian Unwich without cheese and mayo. The avocado spread is great! Burritos, tacos, and naked burritos! It’s like Chipotle but without the Sofritas. They’ve got one vegan donut option, just in case you need a donut! They have amazing falafel, and for the falafel sandwiches, you have the option to add pickles! 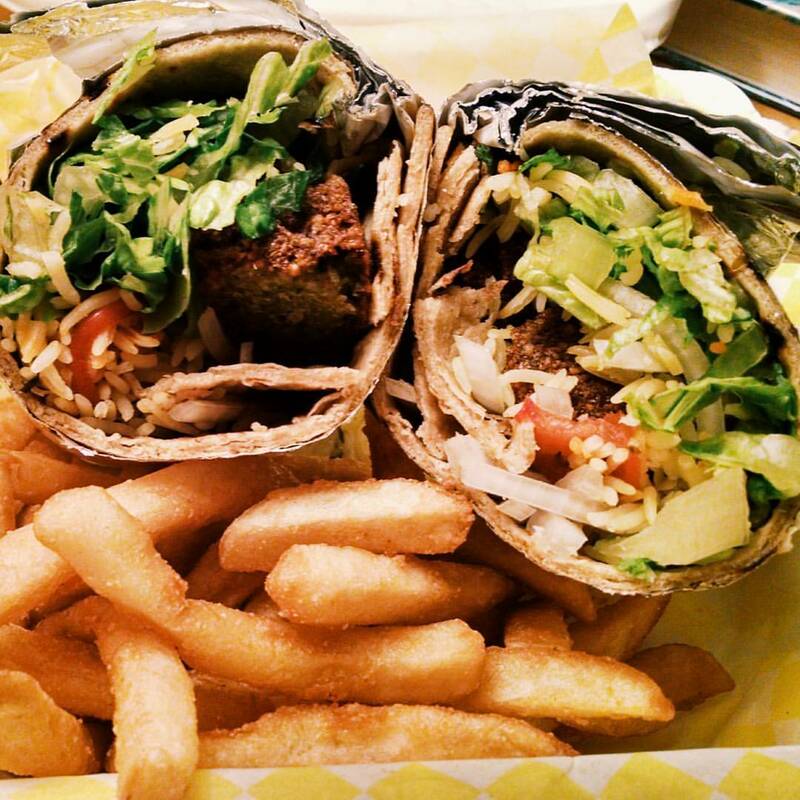 Try the deluxe falafel sandwich that has french fries in it. Also, the baba ghanoush, hummus and pita, and tabouli are all very good. Lots of good stuff! Try the falafel and falafel sandwiches but make sure to order without yogurt sauce and other dairy ingredients. Also, the sambusas, french fries, sweet potato fries, Somali tea, vegetarian platter, and veggie keke are fantastic. Everything is vegetarian, and the vegan items are clearly marked and the staff is knowledgeable. The vegan biscuits and gravy are very popular. Also, their vegan baked goods are out of this world. Sometimes, they’ve got vegan donuts and decadent cupcakes, and often they’ve got huge muffins (like a meal in itself) for just $2.50. Get the vegetarian platter or one of the components of the vegetarian platter. You’re in good hands with mock duck and quinoa on the menu! Comfort food central with a very vegan-friendly menu. They have amazing tater tots, vegan Chicago dog, and po’boy. It’s a great place for brunch, with options including vegan pancakes, french toast, and tofu scramble. Appetizers are discounted during happy hour! A good spot to get snacks between classes! They offer Alternative Baking Company cookies, Holy Land hummus and pita, and Amy’s nondairy burritos. They currently have a vegan hotdog on very specific days, but that may change—as the staff for details! Vegan options include falafel, hummus and pita, baba ghanoush, and fries. You can also get a veggie burrito, but just make sure to ask for no cheese or sour cream. Thanks to all of our student volunteers who contributed to this article with their recommendations! And of course one place to find lots of vegan food on campus will be Twin Cities Veg Fest on October 29 and 30, 2016 at Coffman Memorial Union. The event is free to attend, and there will be lots of free vegan food samples as well as larger meals available for purchase. Join us there!